Citation Information: J Clin Invest. 2005;115(5):1101-1101. https://doi.org/10.1172/JCI120021. Citation Information: J Clin Invest. 2005;115(5):1102-1102. https://doi.org/10.1172/JCI25320. The national debate over Terri Schiavo exposed a critical gap between emotional fervor about brain-injured patients and the medical science that informs standards of care for them. Some of the questions raised in the public and legal forums point to a need for research and enhanced understanding of the mechanisms of recovery from disorders of consciousness. Citation Information: J Clin Invest. 2005;115(5):1104-1104. https://doi.org/10.1172/JCI25140. Citation Information: J Clin Invest. 2005;115(5):1106-1107. https://doi.org/10.1172/JCI25194. Citation Information: J Clin Invest. 2005;115(5):1106-1106. https://doi.org/10.1172/JCI25195. Citation Information: J Clin Invest. 2005;115(5):1107-1108. https://doi.org/10.1172/JCI25238. Citation Information: J Clin Invest. 2005;115(5):1108-1108. https://doi.org/10.1172/JCI25211. Citation Information: J Clin Invest. 2005;115(5):1109-1109. https://doi.org/10.1172/JCI25145. Citation Information: J Clin Invest. 2005;115(5):1110-1110. https://doi.org/10.1172/JCI25144. Citation Information: J Clin Invest. 2005;115(5):1111-1119. https://doi.org/10.1172/JCI25102. Over the last decade, an abundance of evidence has emerged demonstrating a close link between metabolism and immunity. It is now clear that obesity is associated with a state of chronic low-level inflammation. In this article, we discuss the molecular and cellular underpinnings of obesity-induced inflammation and the signaling pathways at the intersection of metabolism and inflammation that contribute to diabetes. We also consider mechanisms through which the inflammatory response may be initiated and discuss the reasons for the inflammatory response in obesity. We put forth for consideration some hypotheses regarding important unanswered questions in the field and suggest a model for the integration of inflammatory and metabolic pathways in metabolic disease. Citation Information: J Clin Invest. 2005;115(5):1121-1129. https://doi.org/10.1172/JCI25100. For approximately 80 years following Alzheimer’s description of the disease that bears his name, a gulf divided researchers who believed that extracellular deposits of the amyloid β (Aβ) peptide were pathogenic from those who believed that the deposits were secondary detritus. Since 1990, the discoveries of missense mutations in the Aβ peptide precursor (APP) and the APP-cleaving enzyme presenilin 1 (PS1) have enabled much progress in understanding the molecular, cellular, and tissue pathology of the aggregates that accumulate in the interstices of the brains of patients with autosomal dominant familial Alzheimer disease (AD). Clarification of the molecular basis of common forms of AD has been more elusive. The central questions in common AD focus on whether cerebral and cerebrovascular Aβ accumulation is (a) a final neurotoxic pathway, common to all forms of AD; (b) a toxic by-product of an independent primary metabolic lesion that, by itself, is also neurotoxic; or (c) an inert by-product of an independent primary neurotoxic reaction. Antiamyloid medications are entering clinical trials so that researchers can evaluate whether abolition of cerebral amyloidosis can mitigate, treat, or prevent the dementia associated with common forms of AD. Successful development of antiamyloid medications is critical for elucidating the role of Aβ in common AD. Citation Information: J Clin Invest. 2005;115(5):1130-1133. https://doi.org/10.1172/JCI25076. An emerging body of evidence implicates peripheral and central endocannabinoid pathways in the regulation of feeding behavior and body weight. A report in this issue of the JCI demonstrates the presence of a common endocannabinoid-regulated molecular pathway for peripheral lipogenic and central appetitive regulation. This pathway involves the activation of the transcription factor SREBP-1c and its associated enzymes, acetyl-CoA carboxylase-1 and fatty acid synthase, in the liver and hypothalamus. Activation of cannabinoid receptor 1 (CB1) in liver plays a key role in increased serum lipid production, fatty liver, and possibly diet-induced obesity. Conversely, stimulation of these receptors in the hypothalamus may lead to an increase in food consumption. Thus, targeting both of these pathways with CB1 antagonists could promote sustained weight loss and favorable serum lipid profiles in obese patients. Chemokine-mediated angiogenesis: an essential link in the evolution of airway fibrosis? Citation Information: J Clin Invest. 2005;115(5):1133-1136. https://doi.org/10.1172/JCI25193. Angiogenesis may be an important factor in the development of fibrotic lung disease. Prior studies have strongly suggested a role for angiogenic vascular remodeling in pulmonary fibrosis, and emerging evidence indicates that new vessel formation is critical in airway fibrosis. Bronchiolitis obliterans syndrome is a fibrotic occlusion of distal airways that is largely responsible for the morbidity and mortality of patients after lung transplantation. In this issue, Belperio et al. demonstrate a role for CXC chemokine receptor 2 in the regulation of angiogenesis-mediated airway fibroproliferation. By integrating an understanding of neovascularization into the study of events that occur between inflammation and fibrosis, it becomes increasingly possible to rationally design therapies that can halt conditions of maladaptive fibrosis. Citation Information: J Clin Invest. 2005;115(5):1136-1139. https://doi.org/10.1172/JCI25152. The inability of insulin to suppress hepatic glucose production (HGP) is a key defect found in type 2 diabetes. Insulin inhibits HGP through both direct and indirect means, the latter of which include inhibition of glucagon secretion, reduction in plasma nonesterified fatty acid level, decrease in the load of gluconeogenic substrates reaching the liver, and change in neural signaling to the liver. Two studies in this issue of the JCI demonstrate that selective changes in the expression of insulin receptors in mouse liver do not have a detectable effect on the ability of insulin to inhibit HGP (see the related articles beginning on pages 1306 and 1314). These provocative data suggest that the indirect effects of insulin on the liver are the primary determinant of HGP in mice. Citation Information: J Clin Invest. 2005;115(5):1139-1142. https://doi.org/10.1172/JCI24930. Nonalcoholic fatty liver disease (NAFLD) is a component of the metabolic syndrome, with a clinical spectrum ranging from simple fatty liver to steatohepatitis, cirrhosis, and hepatocellular carcinoma. The primary event of NAFLD is the accumulation of triacylglycerols (TAGs) in hepatocytes. In this issue of the JCI, Donnelly et al. report on their use of stable isotope methodology to show that fatty acids stored in adipose tissue and fatty acids newly made within the liver through de novo lipogenesis are the major sources of TAGs in the liver and are secreted as lipoproteins in NAFLD. Citation Information: J Clin Invest. 2005;115(5):1142-1144. https://doi.org/10.1172/JCI25148. Infantile cortical hyperostosis (also known as Caffey disease) is characterized by hyperirritability, acute inflammation of soft tissues, and profound alterations of the shape and structure of the underlying bones, particularly the long bones, mandible, clavicles, or ribs. In this issue of the JCI, Gensure et al. undertook fine mapping of the genetic locus for this disease in a large kindred of individuals with the autosomal dominant form of the condition. The authors found a novel missense mutation in COL1A1, the gene encoding the α1 chain of type I collagen, in all affected individuals in 3 discrete pedigrees. This is a surprising finding, as all other reported mutations affecting the synthesis of type I collagen lead to conditions such as osteogenesis imperfecta and Ehlers-Danlos syndrome, in which quantitative or qualitative defects in type I collagen synthesis give rise to bone fragility and/or connective tissue hyperextensibility. The deleterious effect of the mutation on collagen fibril morphology is demonstrated; however, the precise functional link between the reported missense mutation and the localized inflammation and hyperostosis seen in Caffey disease awaits future studies. Citation Information: J Clin Invest. 2005;115(5):1144-1146. https://doi.org/10.1172/JCI25130. Almost a quarter of a century ago, Oldstone and colleagues proposed that infection of cells by noncytopathic viruses may lead to an alteration of the cells’ ability to produce certain products or perform certain tasks, i.e., inhibition of “luxury function.” In this issue of the JCI, this topic has been revisited by Yamano et al., who demonstrate that human T cell lymphotropic virus type I (HTLV-I) infection of CD4+CD25+ Tregs in patients with HTLV-I–associated myelopathy/tropical spastic paraparesis (HAM/TSP) results in a decrease in FOXP3 mRNA and protein expression. This leads to the inability of HTLV-I–infected CD4+CD25+ Tregs to inhibit the proliferation of CD4+CD25− Tregs, due to the effect of the HTLV-I tax gene. Defects in the Treg population could be responsible for the large numbers of virus-specific T cells and occurrence of lymphoproliferation and inflammatory autoimmune disease in HAM/TSP patients. Citation Information: J Clin Invest. 2005;115(5):1146-1149. https://doi.org/10.1172/JCI25000. T and NK cells collaborate to control viral infections, discerning minute differences between infected and uninfected cells. At the same time, viruses have evolved to escape this discovery. In this issue of the JCI, Ganem and colleagues show that Kaposi sarcoma–associated herpesvirus (KSHV) inhibits CD1d presentation to T cells. This novel immune evasion strategy highlights the importance of CD1d-restricted T cells in controlling viral infection and raises an interesting question: how do T cells recognize viruses in the context of CD1 molecules that bind lipids? In the case of herpesviruses, alterations in endosomal trafficking might trigger redistribution of CD1/lipid complexes to cell surfaces, thereby promoting recognition by CD1d-restricted T cells. Citation Information: J Clin Invest. 2005;115(5):1150-1162. https://doi.org/10.1172/JCI24233. Angiogenesis and vascular remodeling support fibroproliferative processes; however, no study has addressed the importance of angiogenesis during fibro-obliteration of the allograft airway during bronchiolitis obliterans syndrome (BOS) that occurs after lung transplantation. The ELR+ CXC chemokines both mediate neutrophil recruitment and promote angiogenesis. Their shared endothelial cell receptor is the G-coupled protein receptor CXC chemokine receptor 2 (CXCR2). We found that elevated levels of multiple ELR+ CXC chemokines correlated with the presence of BOS. Proof-of-concept studies using a murine model of BOS not only demonstrated an early neutrophil infiltration but also marked vascular remodeling in the tracheal allografts. In addition, tracheal allograft ELR+ CXC chemokines were persistently expressed even in the absence of significant neutrophil infiltration and were temporally associated with vascular remodeling during fibro-obliteration of the tracheal allograft. Furthermore, in neutralizing studies, treatment with anti-CXCR2 Abs inhibited early neutrophil infiltration and later vascular remodeling, which resulted in the attenuation of murine BOS. A more profound attenuation of fibro-obliteration was seen when CXCR2–/– mice received cyclosporin A. This supports the notion that the CXCR2/CXCR2 ligand biological axis has a bimodal function during the course of BOS: early, it is important for neutrophil recruitment and later, during fibro-obliteration, it is important for vascular remodeling independent of neutrophil recruitment. Citation Information: J Clin Invest. 2005;115(5):1163-1176. https://doi.org/10.1172/JCI23424. The interactions of transformed cells with the surrounding stromal cells are of importance for tumor progression and metastasis. The relevance of adipocyte-derived factors to breast cancer cell survival and growth is well established. However, it remains unknown which specific adipocyte-derived factors are most critical in this process. Collagen VI is abundantly expressed in adipocytes. Collagen–/– mice in the background of the mouse mammary tumor virus/polyoma virus middle T oncogene (MMTV-PyMT) mammary cancer model demonstrate dramatically reduced rates of early hyperplasia and primary tumor growth. Collagen VI promotes its growth-stimulatory and pro-survival effects in part by signaling through the NG2/chondroitin sulfate proteoglycan receptor expressed on the surface of malignant ductal epithelial cells to sequentially activate Akt and β-catenin and stabilize cyclin D1. Levels of the carboxyterminal domain of collagen VIα3, a proteolytic product of the full-length molecule, are dramatically upregulated in murine and human breast cancer lesions. The same fragment exerts potent growth-stimulatory effects on MCF-7 cells in vitro. Therefore, adipocytes play a vital role in defining the ECM environment for normal and tumor-derived ductal epithelial cells and contribute significantly to tumor growth at early stages through secretion and processing of collagen VI. Citation Information: J Clin Invest. 2005;115(5):1177-1187. https://doi.org/10.1172/JCI23134. Current models of T cell memory implicate a critical role for IL-7 in the effector-to-memory transition, raising the possibility that IL-7 therapy might enhance vaccine responses. IL-7 has not been studied, to our knowledge, before now for adjuvant activity. We administered recombinant human IL-7 (rhIL-7) to mice during immunization against the male antigen HY and compared these results with those obtained from mice immunized with rhIL-2 and rhIL-15. Administration of rhIL-7 or rhIL-15, but not rhIL-2, increased effector cells directed against these dominant antigens and dramatically enhanced CD8+ effectors to subdominant antigens. The mechanisms by which the cytokines augmented effector pool generation were multifactorial and included rhIL-7–mediated costimulation and rhIL-15–mediated augmentation of the proliferative burst. The contraction phase of the antigen-specific response was exaggerated in cytokine-treated mice; however, CD8+ memory pools in rhIL-7– or rhIL-15–treated groups demonstrated superior long-term survival resulting in quantitative advantages that remained long after the cytokines were discontinued, as demonstrated by improved survival after challenge with an HY-expressing tumor undertaken several weeks after cytokine cessation. These results confirm the adjuvant activity of rhIL-15 and demonstrate that rhIL-7 also serves as a potent vaccine adjuvant that broadens immunity by augmenting responses to subdominant antigens and improving the survival of the CD8+ T cell memory pool. Citation Information: J Clin Invest. 2005;115(5):1188-1198. https://doi.org/10.1172/JCI23371. Synaptopodin is the founding member of a novel class of proline-rich actin-associated proteins highly expressed in telencephalic dendrites and renal podocytes. Synaptopodin-deficient (synpo–/–) mice lack the dendritic spine apparatus and display impaired activity-dependent long-term synaptic plasticity. In contrast, the ultrastructure of podocytes in synpo–/– mice is normal. Here we show that synpo–/– mice display impaired recovery from protamine sulfate–induced podocyte foot process (FP) effacement and LPS-induced nephrotic syndrome. Similarly, synpo–/– podocytes show impaired actin filament reformation in vitro. We further demonstrate that synaptopodin exists in 3 isoforms, neuronal Synpo-short (685 AA), renal Synpo-long (903 AA), and Synpo-T (181 AA). The C terminus of Synpo-long is identical to that of Synpo-T. All 3 isoforms specifically interact with α-actinin and elongate α-actinin–induced actin filaments. synpo–/– mice lack Synpo-short and Synpo-long expression but show an upregulation of Synpo-T protein expression in podocytes, though not in the brain. Gene silencing of Synpo-T abrogates stress-fiber formation in synpo–/– podocytes, demonstrating that Synpo-T serves as a backup for Synpo-long in synpo–/– podocytes. In concert, synaptopodin regulates the actin-bundling activity of α-actinin in highly dynamic cell compartments, such as podocyte FPs and the dendritic spine apparatus. Citation Information: J Clin Invest. 2005;115(5):1199-1209. https://doi.org/10.1172/JCI23348. TNF is essential for the development of glomerulonephritis, an immune-mediated disorder that is a major cause of renal failure worldwide. However, TNF has proinflammatory and immunosuppressive properties that may segregate at the level of the 2 TNF receptors (TNFRs), TNFR1 and TNFR2. TNFR1-deficient mice subjected to immune complex–mediated glomerulonephritis developed less proteinuria and glomerular injury, and fewer renal leukocyte infiltrates at early time points after disease induction, and this was associated with a reduced systemic immune response to nephrotoxic rabbit IgG. However, proteinuria and renal pathology were similar to those in wild-type controls at later time points, when lack of TNFR1 resulted in excessive renal T cell accumulation and an associated reduction in apoptosis of these cells. In sharp contrast, TNFR2-deficient mice were completely protected from glomerulonephritis at all time points, despite an intact systemic immune response. TNFR2 was induced on glomerular endothelial cells of nephritic kidneys, and TNFR2 expression on intrinsic cells, but not leukocytes, was essential for glomerulonephritis and glomerular complement deposition. Thus, TNFR1 promotes systemic immune responses and renal T cell death, while intrinsic cell TNFR2 plays a critical role in complement-dependent tissue injury. Therefore, therapeutic blockade specifically of TNFR2 may be a promising strategy in the treatment of immune-mediated glomerulonephritis. Citation Information: J Clin Invest. 2005;115(5):1210-1220. https://doi.org/10.1172/JCI24140. In diabetic LDLR–/– mice, an ectopic BMP2-Msx2 gene regulatory program is upregulated in association with vascular calcification. We verified the procalcific actions of aortic Msx2 expression in vivo. CMV-Msx2 transgenic (CMV-Msx2Tg+) mice expressed 3-fold higher levels of aortic Msx2 than nontransgenic littermates. On high-fat diets, CMV-Msx2Tg+ mice exhibited marked cardiovascular calcification involving aortic and coronary tunica media. This corresponded to regions of Msx2 immunoreactivity in adjacent adventitial myofibroblasts, suggesting a potential paracrine osteogenic signal. To better understand Msx2-regulated calcification, we studied actions in 10T1/2 cells. We found that conditioned media from Msx2-transduced 10T1/2 cells (Msx2-CM) is both pro-osteogenic and adipostatic; these features are characteristic of Wnt signaling. Msx2-CM stimulated Wnt-dependent TCF/LEF transcription, and Msx2-transduced cells exhibited increased nuclear β-catenin localization with concomitant alkaline phosphatase induction. Msx2 upregulated Wnt3a and Wnt7a but downregulated expression of the canonical inhibitor Dkk1. Dkk1 treatment reversed osteogenic and adipostatic actions of Msx2. Teriparatide, a PTH1R agonist that inhibits murine vascular calcification, suppressed vascular BMP2-Msx2-Wnt signaling. Analyses of CMV-Msx2Tg+ mice confirmed that Msx2 suppresses aortic Dkk1 and upregulates vascular Wnts; moreover, TOPGAL+ (Wnt reporter); CMV-Msx2Tg+ mice exhibited augmented aortic LacZ expression. Thus, Msx2-expressing cells elaborated an osteogenic milieu that promotes vascular calcification in part via paracrine Wnt signals. Citation Information: J Clin Invest. 2005;115(5):1221-1231. https://doi.org/10.1172/JCI21968. Cardiac pressure load stimulates hypertrophy, often leading to chamber dilation and dysfunction. ROS contribute to this process. Here we show that uncoupling of nitric oxide synthase–3 (NOS3) plays a major role in pressure load–induced myocardial ROS and consequent chamber remodeling/hypertrophy. Chronic transverse aortic constriction (TAC; for 3 and 9 weeks) in control mice induced marked cardiac hypertrophy, dilation, and dysfunction. Mice lacking NOS3 displayed modest and concentric hypertrophy to TAC with preserved function. NOS3–/– TAC hearts developed less fibrosis, myocyte hypertrophy, and fetal gene re-expression (B-natriuretic peptide and α–skeletal actin). ROS, nitrotyrosine, and gelatinase (MMP-2 and MMP-9) zymogen activity markedly increased in control TAC, but not in NOS3–/– TAC, hearts. TAC induced NOS3 uncoupling in the heart, reflected by reduced NOS3 dimer and tetrahydrobiopterin (BH4), increased NOS3-dependent generation of ROS, and lowered Ca2+-dependent NOS activity. Cotreatment with BH4 prevented NOS3 uncoupling and inhibited ROS, resulting in concentric nondilated hypertrophy. Mice given the antioxidant tetrahydroneopterin as a control did not display changes in TAC response. Thus, pressure overload triggers NOS3 uncoupling as a prominent source of myocardial ROS that contribute to dilatory remodeling and cardiac dysfunction. Reversal of this process by BH4 suggests a potential treatment to ameliorate the pathophysiology of chronic pressure-induced hypertrophy. Citation Information: J Clin Invest. 2005;115(5):1232-1240. https://doi.org/10.1172/JCI22493. Nitrite represents a circulating and tissue storage form of NO whose bioactivation is mediated by the enzymatic action of xanthine oxidoreductase, nonenzymatic disproportionation, and reduction by deoxyhemoglobin, myoglobin, and tissue heme proteins. Because the rate of NO generation from nitrite is linearly dependent on reductions in oxygen and pH levels, we hypothesized that nitrite would be reduced to NO in ischemic tissue and exert NO-dependent protective effects. Solutions of sodium nitrite were administered in the setting of hepatic and cardiac ischemia-reperfusion (I/R) injury in mice. In hepatic I/R, nitrite exerted profound dose-dependent protective effects on cellular necrosis and apoptosis, with highly significant protective effects observed at near-physiological nitrite concentrations. In myocardial I/R injury, nitrite reduced cardiac infarct size by 67%. Consistent with hypoxia-dependent nitrite bioactivation, nitrite was reduced to NO, S-nitrosothiols, N-nitros-amines, and iron-nitrosylated heme proteins within 1–30 minutes of reperfusion. Nitrite-mediated protection of both the liver and the heart was dependent on NO generation and independent of eNOS and heme oxygenase-1 enzyme activities. These results suggest that nitrite is a biological storage reserve of NO subserving a critical function in tissue protection from ischemic injury. These studies reveal an unexpected and novel therapy for diseases such as myocardial infarction, organ preservation and transplantation, and shock states. Citation Information: J Clin Invest. 2005;115(5):1241-1249. https://doi.org/10.1172/JCI23213. A specific hypoglycosylated isoform of the complement regulator membrane cofactor protein (MCP; CD46) is expressed on the inner acrosomal membrane (IAM) of spermatozoa. This membrane is exposed after the acrosome reaction, an exocytosis event that occurs upon contact with the zona pellucida. 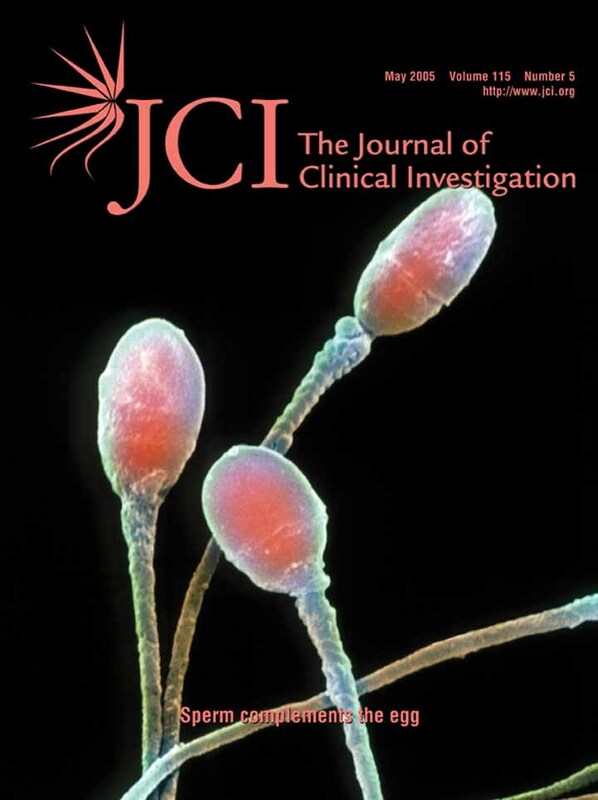 We initiated this investigation to assess MCP’s regulatory function in situ on spermatozoa. Upon exposure of human spermatozoa to autologous serum or follicular fluid, we unexpectedly observed that acrosome-reacted spermatozoa activated the complement cascade efficiently through C3 but not beyond. Using FACS to simultaneously evaluate viability, acrosomal status, and complement deposition, we found that complement activation was initiated by C-reactive protein (CRP) and was C1q, C2, and factor B dependent. This pattern is consistent with engagement of the classical pathway followed by amplification through the alternative pathway. C3b deposition was targeted to the IAM, where it was cleaved to C3bi. Factor H, and not MCP, was the cofactor responsible for C3b cleavage. We propose that this localized deposition of complement fragments aids in the fusion process between the spermatozoa and egg, in a role akin to that of complement in immune adherence. In addition, we speculate that this “targeted and restricted” form of complement activation on host cells is a common strategy to handle modified self. Citation Information: J Clin Invest. 2005;115(5):1250-1257. https://doi.org/10.1172/JCI22760. Infantile cortical hyperostosis (Caffey disease) is characterized by spontaneous episodes of subperiosteal new bone formation along 1 or more bones commencing within the first 5 months of life. A genome-wide screen for genetic linkage in a large family with an autosomal dominant form of Caffey disease (ADC) revealed a locus on chromosome 17q21 (LOD score, 6.78). Affected individuals and obligate carriers were heterozygous for a missense mutation (3040C↠T) in exon 41 of the gene encoding the α1(I) chain of type I collagen (COL1A1), altering residue 836 (R836C) in the triple-helical domain of this chain. The same mutation was identified in affected members of 2 unrelated, smaller families with ADC, but not in 2 prenatal cases and not in more than 300 chromosomes from healthy individuals. Fibroblast cultures from an affected individual produced abnormal disulfide-bonded dimeric α1(I) chains. Dermal collagen fibrils of the same individual were larger, more variable in shape and size, and less densely packed than those in control samples. Individuals bearing the mutation, whether they had experienced an episode of cortical hyperostosis or not, had joint hyperlaxity, hyperextensible skin, and inguinal hernias resembling symptoms of a mild form of Ehlers-Danlos syndrome type III. These findings extend the spectrum of COL1A1-related diseases to include a hyperostotic disorder. Citation Information: J Clin Invest. 2005;115(5):1258-1266. https://doi.org/10.1172/JCI24356. Solute carrier family 11, member 2 (SLC11A2) is the only transmembrane iron transporter known to be involved in cellular iron uptake. It is widely expressed and has been postulated to play important roles in intestinal iron absorption, erythroid iron utilization, hepatic iron accumulation, placental iron transfer, and other processes. Previous studies have suggested that other transporters might exist, but their physiological significance remained uncertain. To define the activities of Slc11a2 in vivo, we inactivated the murine gene that encodes it globally and selectively. We found that fetal Slc11a2 is not needed for materno-fetal iron transfer but that Slc11a2 activity is essential for intestinal non-heme iron absorption after birth. Slc11a2 is also required for normal hemoglobin production during the development of erythroid precursors. However, hepatocytes and most other cells must have an alternative, as-yet-unknown, iron uptake mechanism. We previously showed that Slc11a2 serves as the primary portal for intestinal iron entry in hemochromatosis. However, inactivation of murine Hfe ameliorates the phenotype of animals lacking Slc11a2. Citation Information: J Clin Invest. 2005;115(5):1267-1274. https://doi.org/10.1172/JCI22782. Thrombomodulin (TM) is an endothelial anticoagulant cofactor that promotes thrombin-mediated formation of activated protein C (APC). We have found that the N-terminal lectin-like domain (D1) of TM has unique antiinflammatory properties. TM, via D1, binds high-mobility group-B1 DNA-binding protein (HMGB1), a factor closely associated with necrotic cell damage following its release from the nucleus, thereby preventing in vitro leukocyte activation, in vivo UV irradiation–induced cutaneous inflammation, and in vivo lipopolysaccharide-induced lethality. Our data also demonstrate antiinflammatory properties of a peptide spanning D1 of TM and suggest its therapeutic potential. These findings highlight a novel mechanism, i.e., sequestration of mediators, through which an endothelial cofactor, TM, suppresses inflammation quite distinctly from its anticoagulant cofactor activity, thereby preventing the interaction of these mediators with cell surface receptors on effector cells in the vasculature. Citation Information: J Clin Invest. 2005;115(5):1275-1280. https://doi.org/10.1172/JCI24066. The kidney not only regulates fluid and electrolyte balance but also functions as an endocrine organ. For instance, it is the major source of circulating erythropoietin and renin. Despite currently available therapies, there is a marked increase in cardiovascular morbidity and mortality among patients suffering from end-stage renal disease. We hypothesized that the current understanding of the endocrine function of the kidney was incomplete and that the organ might secrete additional proteins with important biological roles. Here we report the identification of a novel flavin adenine dinucleotide–dependent amine oxidase (renalase) that is secreted into the blood by the kidney and metabolizes catecholamines in vitro (renalase metabolizes dopamine most efficiently, followed by epinephrine, and then norepinephrine). In humans, renalase gene expression is highest in the kidney but is also detectable in the heart, skeletal muscle, and the small intestine. The plasma concentration of renalase is markedly reduced in patients with end-stage renal disease, as compared with healthy subjects. Renalase infusion in rats caused a decrease in cardiac contractility, heart rate, and blood pressure and prevented a compensatory increase in peripheral vascular tone. These results identify renalase as what we believe to be a novel amine oxidase that is secreted by the kidney, circulates in blood, and modulates cardiac function and systemic blood pressure. Citation Information: J Clin Invest. 2005;115(5):1281-1289. https://doi.org/10.1172/JCI23135. Pseudomonas aeruginosa is an important opportunistic pathogen that can cause chronic and often life-threatening infections of the respiratory tract, particularly in individuals with cystic fibrosis (CF). Because infections with P. aeruginosa remain the major cause of the high morbidity and mortality of CF, a vaccine against P. aeruginosa would be very useful for preventing this disorder. The outer membrane protein F (OprF) of P. aeruginosa is a promising vaccine candidate and various B cell epitopes within OprF have been identified. Given that adenovirus (Ad) vectors have strong immunogenic potential and can function as adjuvants for genetic vaccines, the present study evaluates the immunogenic and protective properties of a novel replication-deficient Ad vector in which the Ad hexon protein was modified to include a 14–amino acid epitope of P. aeruginosa OprF (Epi8) in loop 1 of the hypervariable region 5 of the hexon (AdZ.Epi8). Immunization of C57BL/6 mice with AdZ.Epi8 resulted in detectable serum anti–P. aeruginosa and anti-OprF humoral responses. These responses were haplotype dependent, with higher serum anti-OprF titers in CBA mice than in BALB/c or C57BL/6 mice. AdZ.Epi8 induced Epi8-specific IFN-γ–positive CD4 and CD8 T cell responses and resulted in protection against a lethal pulmonary challenge with agar-encapsulated P. aeruginosa. Importantly, repeated administration of AdZ.Epi8 resulted in boosting of the anti-OprF humoral and anti-Epi8 cellular response, whereas no boosting effect was present in the response against the transgene β-galactosidase. These observations suggest that Ad vectors expressing pathogen epitopes in their capsid will protect against an extracellular pathogen and will allow boosting of the epitope-specific humoral response with repeated administration, a strategy that should prove useful in developing Ad vectors as vaccines where humoral immunity will be protective. Citation Information: J Clin Invest. 2005;115(5):1290-1297. https://doi.org/10.1172/JCI21514. CD36 mediates the transfer of fatty acids (FAs) across the plasma membranes of muscle and adipose cells, thus playing an important role in regulating peripheral FA metabolism in vivo. In the proximal intestine, CD36 is localized in abundant quantities on the apical surface of epithelial cells, a pattern similar to that of other proteins implicated in the uptake of dietary FAs. To define the role of CD36 in the intestine, we examined FA utilization and lipoprotein secretion by WT and CD36-null mice in response to acute and chronic fat feeding. CD36-null mice given a fat bolus by gavage or fed a high-fat diet accumulated neutral lipid in the proximal intestine, which indicated abnormal lipid processing. Using a model in which mice were equipped with lymph fistulae, we obtained evidence of defective lipoprotein secretion by directly measuring lipid output. The secretion defect appeared to reflect an impaired ability of CD36-null enterocytes to efficiently synthesize triacylglycerols from dietary FAs in the endoplasmic reticulum. In the plasma of intact mice, the reduced intestinal lipid secretion was masked by slow clearance of intestine-derived lipoproteins. The impaired clearance occurred despite normal lipoprotein lipase activity and likely reflected feedback inhibition of the lipase by FAs due to their defective removal from the plasma. We conclude that CD36 is important for both secretion and clearance of intestinal lipoproteins. CD36 deficiency results in hypertriglyceridemia both in the postprandial and fasting states and in humans may constitute a risk factor for diet-induced type 2 diabetes and cardiovascular disease. Citation Information: J Clin Invest. 2005;115(5):1298-1305. https://doi.org/10.1172/JCI23057. Endogenous cannabinoids acting at CB1 receptors stimulate appetite, and CB1 antagonists show promise in the treatment of obesity. CB1–/– mice are resistant to diet-induced obesity even though their caloric intake is similar to that of wild-type mice, suggesting that endocannabinoids also regulate fat metabolism. Here, we investigated the possible role of endocannabinoids in the regulation of hepatic lipogenesis. Activation of CB1 in mice increases the hepatic gene expression of the lipogenic transcription factor SREBP-1c and its targets acetyl-CoA carboxylase-1 and fatty acid synthase (FAS). Treatment with a CB1 agonist also increases de novo fatty acid synthesis in the liver or in isolated hepatocytes, which express CB1. High-fat diet increases hepatic levels of the endocannabinoid anandamide (arachidonoyl ethanolamide), CB1 density, and basal rates of fatty acid synthesis, and the latter is reduced by CB1 blockade. In the hypothalamus, where FAS inhibitors elicit anorexia, SREBP-1c and FAS expression are similarly affected by CB1 ligands. We conclude that anandamide acting at hepatic CB1 contributes to diet-induced obesity and that the FAS pathway may be a common molecular target for central appetitive and peripheral metabolic regulation. Citation Information: J Clin Invest. 2005;115(5):1306-1313. https://doi.org/10.1172/JCI23109. Insulin exerts its potent effects on hepatic glucose fluxes via direct and indirect mechanisms. Whereas a liver-specific insulin receptor (IR) knockout (LIRKO) mouse exhibits glucose intolerance as well as insulin resistance, it is unclear whether a more acute decrease in the expression of hepatic IR would be sufficient to induce hepatic insulin resistance. Here we report that the downregulation of hepatic IR expression by up to 95% does not modify hepatic insulin action. The i.p. administration (2 injections over 1 week) of an antisense oligodeoxynucleotide (ASO) directed to reduce insulin expression downregulated hepatic IR expression in C57BL6J mice. A high dose of IR-ASO decreased IR protein approximately 95%, while a control-ASO failed to modify IR expression. At this dose, the IR-ASO also decreased IR expression in adipose tissue but did not significantly decrease IR expression in hypothalamus or skeletal muscle. Insulin action was assessed with insulin clamp studies in conscious mice. The rate of glucose infusion during the clamp studies was comparable in control-ASO– and IR-ASO–treated mice. Importantly, the depletion of liver IR protein markedly impaired downstream insulin signaling in the liver, but it failed to modify the rate of glucose production. Thus, near ablation of liver IR does not alter insulin action on glucose production. Citation Information: J Clin Invest. 2005;115(5):1314-1322. https://doi.org/10.1172/JCI23096. Partial restoration of insulin receptor Insr expression in brain, liver, and pancreatic β cells is sufficient for rescuing Insr knockout mice from neonatal death, preventing diabetes ketoacidosis, and normalizing life span and reproductive function. However, the transgenically rescued mice (referred to as L1) have marked hyperinsulinemia, and approximately 30% develop late-onset type 2 diabetes. Analyses of protein expression indicated that L1 mice had modestly reduced Insr content but normal insulin-stimulated Akt phosphorylation in the liver. Conversely, L1 mice had a near complete ablation of Insr protein product in the arcuate and paraventricular nuclei of the hypothalamus, which was associated with a failure to undergo insulin-dependent Akt phosphorylation in the hypothalamus. To test whether reconstitution of insulin signaling in the liver is sufficient for restoring in vivo hepatic insulin action, we performed euglycemic hyperinsulinemic clamp studies in conscious L1 and WT mice. During the clamp, L1 mice required an approximately 50% lower rate of glucose infusion than did WT controls, while the rate of glucose disappearance was not significantly altered. Conversely, the rate of glucose production was increased approximately 2-fold in L1 mice. Thus, restoration of hepatic insulin signaling in Insr knockout mice fails to normalize the in vivo response to insulin. Citation Information: J Clin Invest. 2005;115(5):1323-1332. https://doi.org/10.1172/JCI23219. Elevated plasma levels of VLDL triglycerides (TGs) are characteristic of patients with type 2 diabetes mellitus (T2DM) and are associated with increased production rates (PRs) of VLDL TGs and apoB. Lipoprotein lipase–mediated (LPL-mediated) lipolysis of VLDL TGs may also be reduced in T2DM if the level of LPL is decreased and/or the level of plasma apoC-III, an inhibitor of LPL-mediated lipolysis, is increased. We studied the effects of pioglitazone (Pio), a PPARγ agonist that improves insulin sensitivity, on lipoprotein metabolism in patients with T2DM. Pio treatment reduced TG levels by increasing the fractional clearance rate (FCR) of VLDL TGs from the circulation, without changing direct removal of VLDL particles. This indicated increased lipolysis of VLDL TGs during Pio treatment, a mechanism supported by our finding of increased plasma LPL mass and decreased levels of plasma apoC-III. Lower apoC-III levels were due to reduced apoC-III PRs. We saw no effects of Pio on the PR of either VLDL TG or VLDL apoB. Thus, Pio, a PPARγ agonist, reduced VLDL TG levels by increasing LPL mass and inhibiting apoC-III PR. These 2 changes were associated with an increased FCR of VLDL TGs, almost certainly due to increased LPL-mediated lipolysis. Citation Information: J Clin Invest. 2005;115(5):1333-1342. https://doi.org/10.1172/JCI23915. Patients with Tangier disease exhibit extremely low plasma HDL concentrations resulting from mutations in the ATP-binding cassette, sub-family A, member 1 (ABCA1) protein. ABCA1 controls the rate-limiting step in HDL particle assembly by mediating efflux of cholesterol and phospholipid from cells to lipid-free apoA-I, which forms nascent HDL particles. ABCA1 is widely expressed; however, the specific tissues involved in HDL biogenesis are unknown. To determine the role of the liver in HDL biogenesis, we generated mice with targeted deletion of the second nucleotide-binding domain of Abca1 in liver only (Abca1–L/–L). Abca1–L/–L mice had total plasma and HDL cholesterol concentrations that were 19% and 17% those of wild-type littermates, respectively. In vivo catabolism of HDL apoA-I from wild-type mice or human lipid-free apoA-I was 2-fold higher in Abca1–L/–L mice compared with controls due to a 2-fold increase in the catabolism of apoA-I by the kidney, with no change in liver catabolism. We conclude that in chow-fed mice, the liver is the single most important source of plasma HDL. Furthermore, hepatic, but not extrahepatic, Abca1 is critical in maintaining the circulation of mature HDL particles by direct lipidation of hepatic lipid-poor apoA-I, slowing its catabolism by the kidney and prolonging its plasma residence time. Citation Information: J Clin Invest. 2005;115(5):1343-1351. https://doi.org/10.1172/JCI23621. Nonalcoholic fatty liver disease (NAFLD) is characterized by the accumulation of excess liver triacylglycerol (TAG), inflammation, and liver damage. The goal of the present study was to directly quantify the biological sources of hepatic and plasma lipoprotein TAG in NAFLD. Patients (5 male and 4 female; 44 ± 10 years of age) scheduled for a medically indicated liver biopsy were infused with and orally fed stable isotopes for 4 days to label and track serum nonesterified fatty acids (NEFAs), dietary fatty acids, and those derived from the de novo lipogenesis (DNL) pathway, present in liver tissue and lipoprotein TAG. Hepatic and lipoprotein TAG fatty acids were analyzed by gas chromatography/mass spectrometry. NAFLD patients were obese, with fasting hypertriglyceridemia and hyperinsulinemia. Of the TAG accounted for in liver, 59.0% ± 9.9% of TAG arose from NEFAs; 26.1% ± 6.7%, from DNL; and 14.9% ± 7.0%, from the diet. The pattern of labeling in VLDL was similar to that in liver, and throughout the 4 days of labeling, the liver demonstrated reciprocal use of adipose and dietary fatty acids. DNL was elevated in the fasting state and demonstrated no diurnal variation. These quantitative metabolic data document that both elevated peripheral fatty acids and DNL contribute to the accumulation of hepatic and lipoprotein fat in NAFLD. Citation Information: J Clin Invest. 2005;115(5):1352-1360. https://doi.org/10.1172/JCI23661. MS is a chronic inflammatory and demyelinating disease of the CNS with as yet unknown etiology. A hallmark of this disease is the occurrence of oligoclonal IgG antibodies in the cerebrospinal fluid (CSF). To assess the specificity of these antibodies, we screened protein expression arrays containing 37,000 tagged proteins. The 2 most frequent MS-specific reactivities were further mapped to identify the underlying high-affinity epitopes. In both cases, we identified peptide sequences derived from EBV proteins expressed in latently infected cells. Immunoreactivities to these EBV proteins, BRRF2 and EBNA-1, were significantly higher in the serum and CSF of MS patients than in those of control donors. Oligoclonal CSF IgG from MS patients specifically bound both EBV proteins. Also, CD8+ T cell responses to latent EBV proteins were higher in MS patients than in controls. In summary, these findings demonstrate an increased immune response to EBV in MS patients, which suggests that the virus plays an important role in the pathogenesis of disease. Citation Information: J Clin Invest. 2005;115(5):1361-1368. https://doi.org/10.1172/JCI23913. CD4+CD25+ Tregs are important in the maintenance of immunological self tolerance and in the prevention of autoimmune diseases. As the CD4+CD25+ T cell population in patients with human T cell lymphotropic virus type I–associated (HTLV-I–associated) myelopathy/tropical spastic paraparesis (HAM/TSP) has been shown to be a major reservoir for this virus, it was of interest to determine whether the frequency and function of CD4+CD25+ Tregs in HAM/TSP patients might be affected. In these cells, both mRNA and protein expression of the forkhead transcription factor Foxp3, a specific marker of Tregs, were lower than those in CD4+CD25+ T cells from healthy individuals. The virus-encoded transactivating HTLV-I tax gene was demonstrated to have a direct inhibitory effect on Foxp3 expression and function of CD4+CD25+ T cells. This is the first report to our knowledge demonstrating the role of a specific viral gene product (HTLV-I Tax) on the expression of genes associated with Tregs (in particular, foxp3) resulting in inhibition of Treg function. These results suggest that direct human retroviral infection of CD4+CD25+ T cells may be associated with the pathogenesis of HTLV-I–associated neurologic disease. Citation Information: J Clin Invest. 2005;115(5):1369-1378. https://doi.org/10.1172/JCI24041. Little is known about the role of CD1d-restricted T cells in antiviral immune responses. Here we show that the lytic replication cycle of the Kaposi sarcoma–associated herpesvirus (KSHV) promotes downregulation of cell-surface CD1d. This is caused by expression of the 2 modulator of immune recognition (MIR) proteins of the virus, each of which promotes the loss of surface CD1d expression following transfection into uninfected cells. Inhibition of CD1d surface expression is due to ubiquitination of the CD1d α-chain on a unique lysine residue in its cytoplasmic tail, which triggers endocytosis. Unlike MIR-mediated MHC class I downregulation, however, CD1d downregulation does not appear to include accelerated lysosomal degradation. MIR2-induced downregulation of CD1d results in reduced activation of CD1d-restricted T cells in vitro. KSHV modulation of CD1d expression represents a strategy for viral evasion of innate host immune responses and implicates CD1d-restricted T cells as regulators of this viral infection. Citation Information: J Clin Invest. 2005;115(5):1379-1387. https://doi.org/10.1172/JCI22452. With-no-lysine (WNK) kinases are highly expressed along the mammalian distal nephron. Mutations in either WNK1 or WNK4 cause familial hyperkalemic hypertension (FHHt), suggesting that the protein products converge on a final common pathway. We showed previously that WNK4 downregulates thiazide-sensitive NaCl cotransporter (NCC) activity, an effect suppressed by WNK1. Here we investigated the mechanisms by which WNK1 and WNK4 interact to regulate ion transport. We report that WNK1 suppresses the WNK4 effect on NCC activity and associates with WNK4 in a protein complex involving the kinase domains. Although a kinase-dead WNK1 also associates with WNK4, it fails to suppress WNK4-mediated NCC inhibition; the WNK1 kinase domain alone, however, is not sufficient to block the WNK4 effect. The carboxyterminal 222 amino acids of WNK4 are sufficient to inhibit NCC, but this fragment is not blocked by WNK1. Instead, WNK1 inhibition requires an intact WNK4 kinase domain, the region that binds to WNK1. In summary, these data show that: (a) the WNK4 carboxyl terminus mediates NCC suppression, (b) the WNK1 kinase domain interacts with the WNK4 kinase domain, and (c) WNK1 inhibition of WNK4 is dependent on WNK1 catalytic activity and an intact WNK1 protein. These findings provide insight into the complex interrelationships between WNK1 and WNK4 and provide a molecular basis for FHHt. Citation Information: J Clin Invest. 2005;115(5):1388-1388. https://doi.org/10.1172/JCI22433C1. Citation Information: J Clin Invest. 2005;115(5):1388-1388. https://doi.org/10.1172/JCI23187C1. Citation Information: J Clin Invest. 2005;115(5):1389-1389. https://doi.org/10.1172/JCI23006C1.